The Sole Runners held their First Annual Charity Meet-n-Greet at McKenna's On The Bay last night. Non-profit organizations were invited to set up a table and speak about their cause to our running group. Representatives from Arts Council For Long Beach, National Marfan Foundation, and Real Medicine Foundation attended the event. 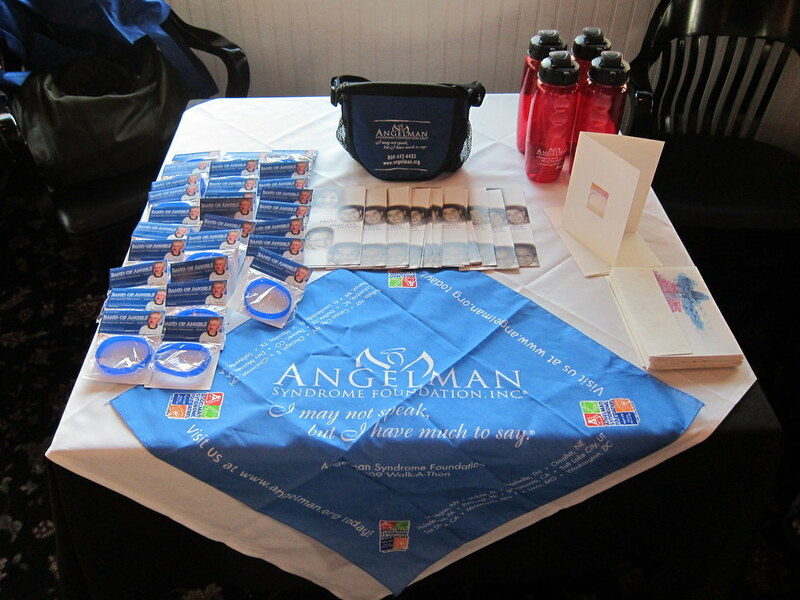 I represented the Angelman Syndrome Foundation. I explained the Angelman Syndrome Foundation is a charity that is close to my heart because my niece was diagnosed with Angelman Syndrome. I described the genetic disorder and the characteristics including developmental delay, happy demeanor, speech impairment, arm flapping, and drooling. I shared how she is non-verbal but can communicate using augmentative communication devices and some American Sign Language (ASL). I mentioned how I'm running the Athens Classic Marathon to raise money for the Angelman Syndrome Foundation. All the money that is donated will be used for research. I love my niece but I hope scientists can find a cure so there wouldn't be any more children born with this disorder. I discovered that the Arts Council For Long Beach created a We Love LB Arts! campaign to recruit Long Beach Marathon participants to choose the Arts Council For Long Beach as their charity recipient. The money raised would be distributed to both community-based and school-based arts programs. We Love LB Arts! volunteers will be at the marathon showing their support and showcasing local art. I learned that Marfan Syndrome is a genetic disorder that affects connective tissue and typically attacks the heart. The syndrome is not easily diagnosed and often goes undetected. Diagnosis is usually made by a medical geneticist or a cardiologist because this disease often attacks the heart. I was really impressed by the Real Medicine Foundation. The organization operates in 15 countries in four continents by establishing mobile and stationary health clinics. The fact that they employ regional staff really resonated with me. As a bleeding heart Green Girl, I've taken courses on the sustainability of support and aid to Third World countries and I am aware of the obstacles encountered when trying to implement lasting improvements. I really enjoyed the First Annual Charity Meet-n-Greet. I was truly inspired by the philanthropy of the organizations and the volunteers. That's a cool event and a good chance to be educated on these various organizations. You're so awesome, Greenie! I truly mean that! I hope someday there's a cure for your niece and others born with this. Aww! I wish you would have told me about this! It seemed pretty cool! Your booth looks so pro!